No matter how experienced you are, job interviews are always a testing and nerve-wracking experience. 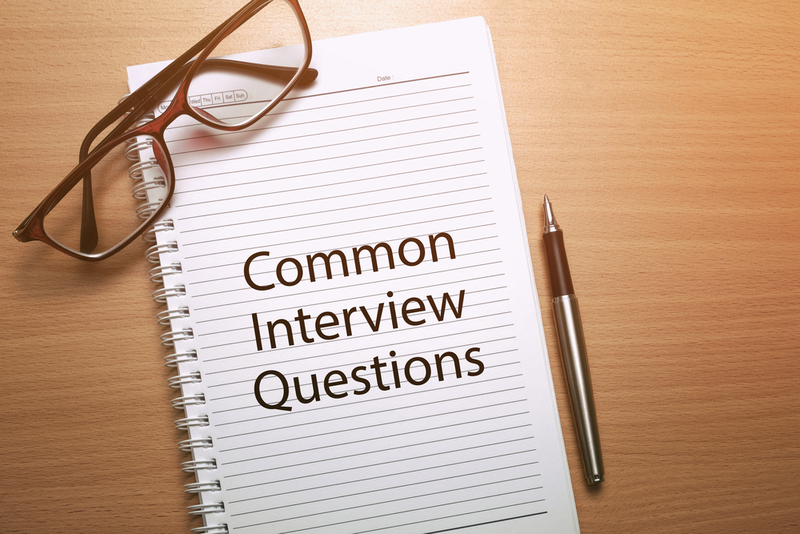 We’ve already discussed the importance of general interview preparation in another blog, so now we’re focusing on getting organised so you can answer some of the more frequent interview questions. These questions crop up in interviews across all industries, sectors and roles, so no matter what type of job you’re applying for, you’ll give yourself a better chance of success by ensuring you’re equipped with a well-constructed answer to each query. This question is likely to be the first thing you’re asked at your interview. It might appear that the interviewer is simply looking to put you at ease and find out a little more about you, but it’s also designed to see how you react to being placed under the spotlight. The key to answering this question is to remember that you’re applying for a job; the interviewer is not looking for your life story! So give a little bit of insight into your hobbies but keep your reply concise and mainly focus on things that are pertinent to the position, such as your experience, relevant skills and qualifications. Here, the interviewer is trying to gain an insight into what motivates you and how you manage relationships with colleagues. Whatever you do, DON’T criticise your current boss, colleagues or working environment as this will immediately flag you up as someone who is difficult to manage and likely to create a toxic working environment. What you should do is stay positive, enthusiastic and demonstrate that you’ve researched the business by linking your reply to the role you’re applying for. For example, explain how you’re suited to the company culture and that you’re excited about the prospect of learning some new skills. Other good answers include the desire for more responsibility/career growth or the opportunity to improve your work/life balance. If you are not currently employed, you may be asked why you left your last role. Again, avoid negativity and focus on positives, such as what you learnt from the experience. What would say is your main weakness? The aim of this question is to test your levels of self-awareness and it’s a difficult one because you’re being asked about professional limitations, when all you want to do is talk about your strengths. When answering, don’t give a feeble answer like ‘My weakness is I’m a perfectionist’ as the interviewer will see straight through this tired cliché. Likewise, saying you don’t have any deficiencies is obviously a lie and no-one will employ someone who doesn’t tell the truth. Instead, prepare your response before the interview and place the emphasis on how you are working towards improving your skills in this area or how you have overcome your weakness. For example, if you have a tendency to finish work at the last minute, you could explain how you’re focused on improving your time management, organisational and delegation skills. What would you like to be doing in five years’ time? This question is designed to assess your planning skills as well as your future ambitions. Ultimately, the hiring manager wants to make sure you’re not viewing their job as a stop-gap. Your response will depend on the seniority of the role and the opportunities within the company you’re applying to. If you’re looking at an entry level position, describe how you’re looking to work your way up the company ladder. If the role is more senior, research the company’s plans and explain how you would help them achieve their goals. Ultimately you should focus on what you want to be doing and achieving, rather than the job title you’re applying for. To further impress the interviewer and leave a positive impression, be energetic when giving your reply, focus on your strengths and display enthusiasm. With this question, the interviewer is assessing your motivation and enthusiasm for the role. An engaged employee who is keen and eager is more likely to put the hours in and stay in the role longer, so that’s what you need to convey when giving your reply. That means steering clear of mentioning the salary or holidays; you don’t want to come across as being more interested in the benefits than the opportunity! As with many interview questions, the key to answering this one well lies in preparation and thorough research. Start with the company website then expand and check their social media channels, news and blog pages. What interests you about the company and their service? Does the company culture appeal to you? Have there been any developments or challenges within their industry? Perhaps they’ve recently expanded the business or moved into new markets. You can also get a feel for the company by reading external reviews on websites such as Glassdoor. Once you’ve focused in on what it is about the role that appeals, you need to explain this to the interviewer whilst demonstrating how your skills and experience will help the company in the future. Hopefully this advice will help you construct some well-rounded and crafted replies to some of the more common interview questions. The key is to be prepared; do plenty of research and practice your responses until they become familiar and honed but still flow naturally. An interview is your chance to put a personality to the skills and qualifications on your CV, so it’s important that your answers reflect your character and paint you as someone who is reliable, enthusiastic and committed. If you can do all these things and remain calm and composed during your interview, you’ll make a fantastic impression and put yourself in a great position to land that job.